Blandinsville (population 777) is located in upper-western Illinois. This northwestern McDonough County town is located about 10 miles northwest of Macomb. Illinois Route 9 is the main road in town and connects it to U.S. Route 67 about 9 miles to the east. The Little Creek and Baptist Creek flow to the north and south of town, respectively. The Toledo, Peoria, & Western Railroad also travels through town. The town and its school history are long and storied. The town name is derived from the first store owner in the area, Joseph L. Blandin. The town was not actually platted until 1842 and began to develop from there. The first school was begun in the late 1830s in the Blandinsville area. A school building was erected for the town's children in 1868. Due to the growing population of school-aged children, a new school building was erected in 1905. 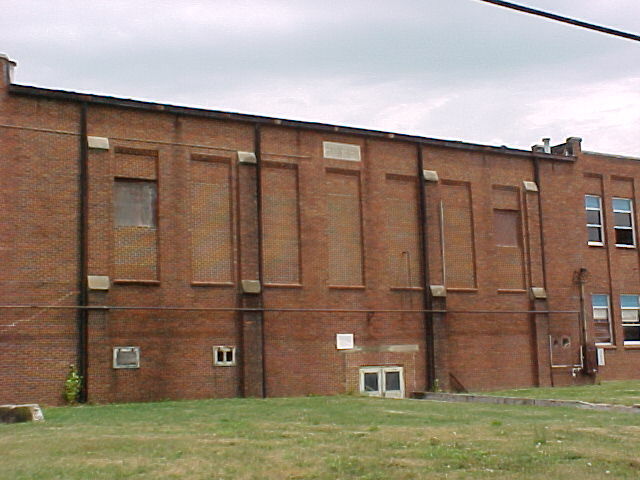 An addition which included a gymnasium was built onto the structure in 1924. Tragedy struck the town when the school building burned to the ground in 1934. Plans to build a new school were immediately set in motion. 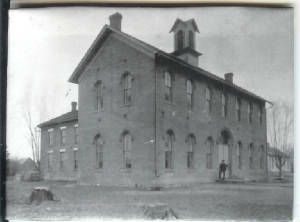 The children had the adventure of going to class in several builidngs around town as the new school was being erected. The building was completed in time for the Class of 1936's graduation ceremony. 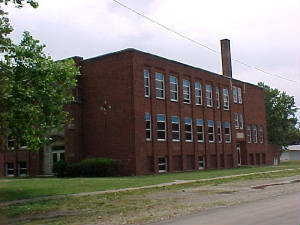 Blandinsville's school building continued to serve the Northwestern School District through 1975 as a grade school. A new building was built in Good Hope, allowing for the closing of the Blandinsville school. The building was given to the town of Blandinsville. "I have some information for you on the current standing of the retired Blandinsville Illinois High/Grade School. Shortly after it was given to the city it was converted into an emergency fallout shelter in which the nuclear fallout shelter signs still hang outside. In the 90's the roof began to fail and was contracted and replaced. The building was partially renovated with the intention of being transformed into a community center. 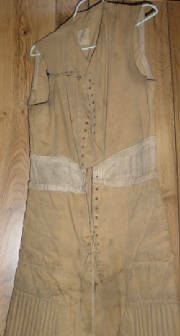 The district that Blandinsville originally consolidated into (northwestern cusd 175, which is now consolidated again to include the towns of Colchester and Tennessee to create West Praire cusd 103 ) held their spring plays in the gymnasium for several years. However only a few years after the roof was re-done it failed again, and the contractor that did the job was nowhere to be found. With everyone discouraged and insufficient funds to fix the roof again (I believe it was the late ninteys) it was sold to a private citizen for $1.00. He currently rents a few of the still decent rooms inside for storage. The roof still leaks and the gap constantly grows larger. Due to interior cealing collapse the southwest stairwell is for the most part impassable as well as the classrooms on the southwest side on the 3rd floor. Also the southwest corner of the gymnasium has begun to warp and buckle due to water damage. The doors and windows outside and inside remain mostly intact and the large cast iron boiler in the basement still remains. There are still a few desks, chairs, and tables in the basement in what is left of the old boys lockerroom (partially destroyed when the plans for renovating the school were still in play). Also the folding seating in the gymnasium remains except for the balcony (upper deck area) in which the seating has been removed. All the lockers have been removed. All the fire, electrical, water, and plumbing systems have been disconnected." School Fight Song: "Here Comes old B'Ville!" To make old B'ville win! As you can see above, Blandinsville High School definitely offered boys basketball. It is probable that baseball and track were also offered. Unfortunately there is no mention of these sports for Blandinsville High on the IHSA website (www.ihsa.org). We are unsure of the school's mascot, team colors, or school fight song. We are also searching for the records and coaches names of the better BHS hardwood court stars of the past. "During the 1940's the schools in the Lamoine Valley Conference were, in football, Western High Of Macomb( WIU's lab school), Blandinsville High, LaHarpe High, Warsaw High, Hamilton High, Industry and Carthage. In basketball add to that list Dallas City, Colchester, and Plymouth. Track consisted of the same ten schools. Not many schools in the area offered baseball. I think the three schools that didn't offer football maybe offered fall baseball instead." Blandinsville coaches of the late 1940s included Jack Krashaurr (possibly mispelled) Former star halfback at WIU who was originally from Warsaw. Harold Slater also coached at Blandinsville and was a former football and basketball player from Bradley by way of Quincy. These coaches may have been preceded by Rosco Scott. The Blandinsville High School "Rams" had some nice seasons on the hardwood court. Unfortunately season records and coaches' names of each year are currently not available. Scores from the annual postseason IHSA tournament were located on a website titled "Illinois Postseason Basketball Scores." Not all Blandinsville scores are listed on this site, however the scores we did locate are listed below. 1948-49 was the final season for Blandinsville High School. 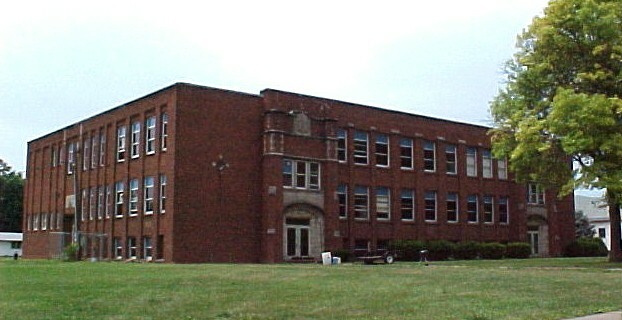 BHS became part of the Northwestern School District in the fall of 1949. 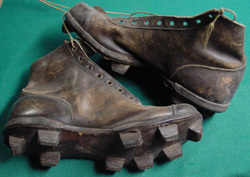 The late 1800s and early 1900s saw the tough sport of football played in Blandinsville. 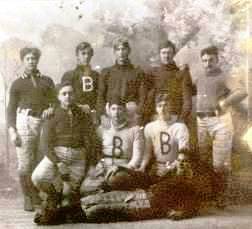 Blandinsville High School competed in football and was where the ancestors of Rick Hamilton started what became five generations of Illinois High School football players from the Hamilton family! 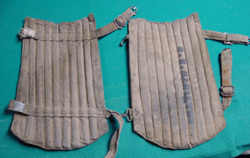 Above, to the right, and below are pictured a parts of a uniform which was wore by Rick's grandfather, Dale Willis Hamilton, when he played pro football for a team in Canton, Illinois!! In the photos below you will see members of the first Hamilton family boys to play football in Illinois. In the 1888 photo on the left is Elmer Hamilton (top row to the far left) and his brother Ed Hamilton (top row, fourth from the left). The photo to the right depicts the Blandinsville team of 1918. 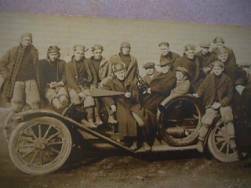 Dale Willis Hamilton can be viewed as the second guy from the left on the car. "When I was in school one coach handled all three sports; football, basketball, and track. Enrollment when I was at B'ville High was probably less than 100. My graduating class had a total of sixteen students. I won't attempt to name any "STARS" as I would leave names out that should be on the list. During my time there the athletic progam was not at its best until the later years of Coach Slater, after the consolidation effort had taken place. Track was probably the strongest program in the late 40's."